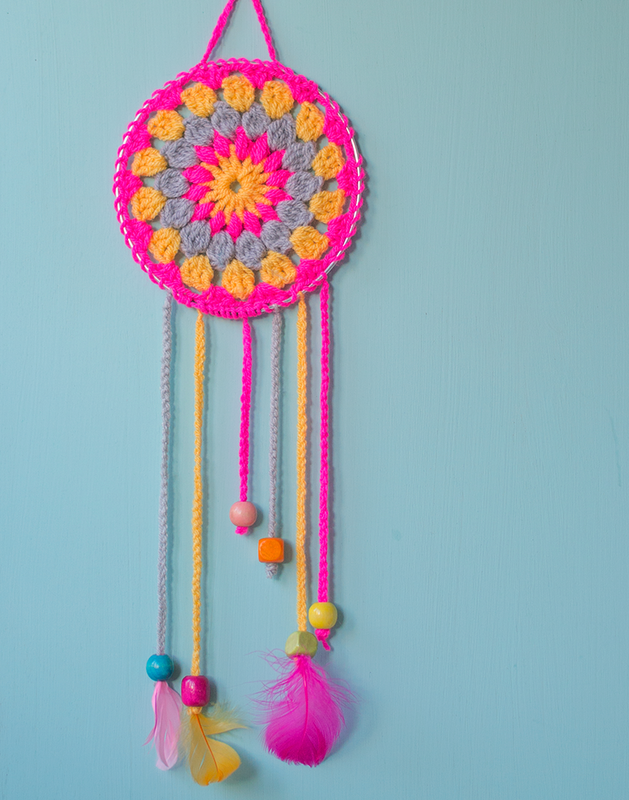 Dream catchers are a Native American tradition. They used them for protection against negative dreams as it was believed they would get caught in the net while the positive dreams managed to go through the hole. It’s such a lovely idea and one that I wanted to bring into our home. Cherry has horrible dreams sometimes so the idea of hanging something next to her bed that would catch them meant that she wasn’t so scared at bedtime. 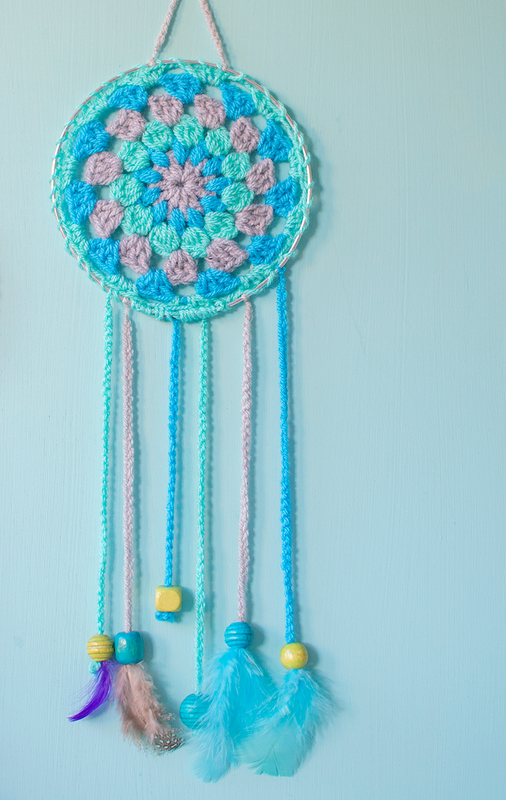 As I have recently developed a love of crochet I decided to combine both these ideas and make some crocheted dream catchers. 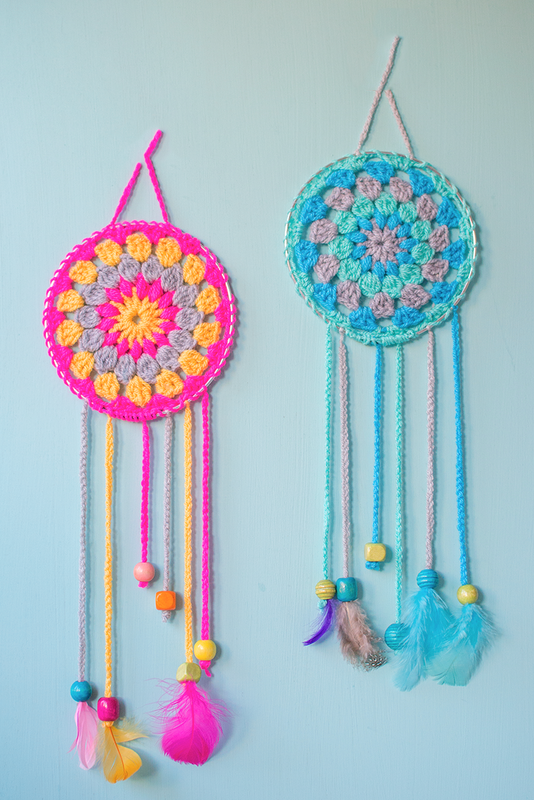 How to make dream catchers.. 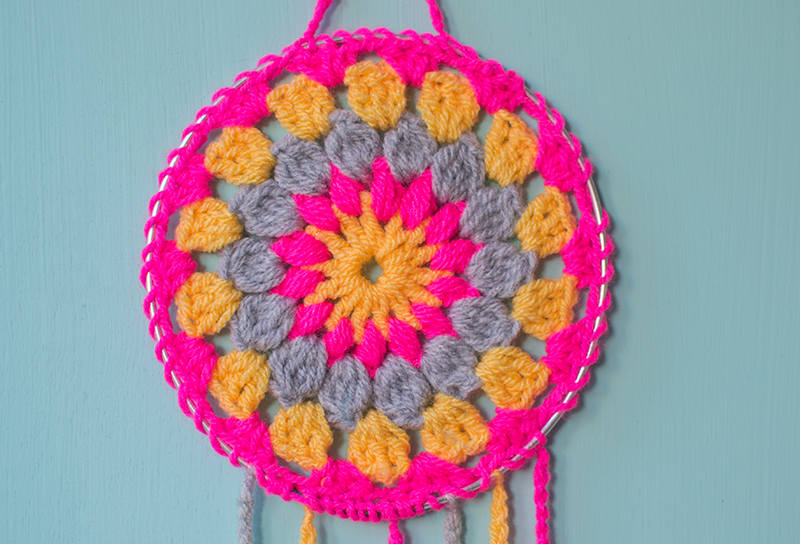 I used this sunburst granny square video tutorial by Bella Coco but when it gets to part four I used all treble stitches instead of half trebles, trebles and double trebles resulting in a larger circle instead of turning it into a square. You could make the circle as big as you like this way. I actually only learnt how to crochet at the start of the year and this type of granny square was the second one I learnt after the basic granny square so this is a great project for beginners. I made the circle frame using some bendy metal, I use my partner’s welding rods but you could use a metal coat hanger or any other kind of bendy metal, in fact I guess even a pipe cleaner would work. Once I had made the circle the size I wanted I pushed the bendy metal around the outside of the circle underneath the outer layer of stitches. I chain stitched until I had a piece long enough to hang them up, tied it on then weaved the ends into the back using a large plastic needle. I then made lots of long lengths using a chain stitch before tying them onto the bottom of the circle, I weaved the ends in on the back of the dream catchers. 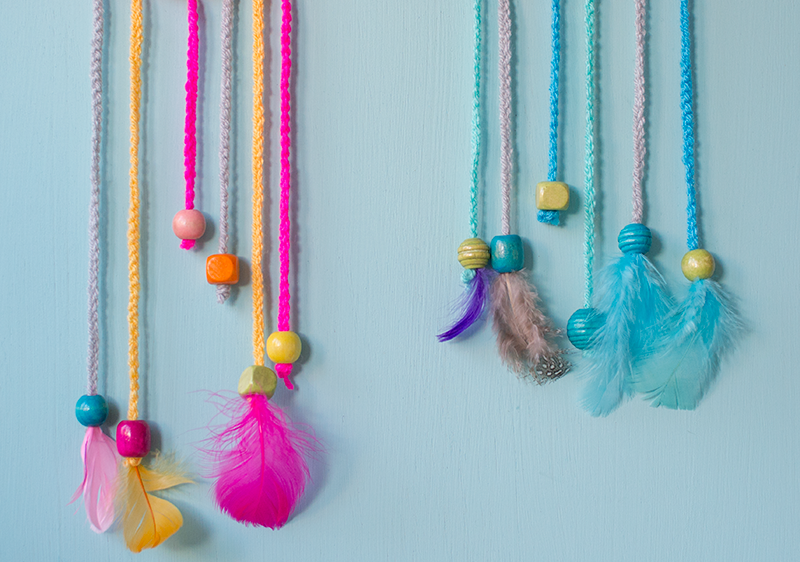 I tied a bead on to the bottom of each one and then pushed a feather into the hole on the bead. 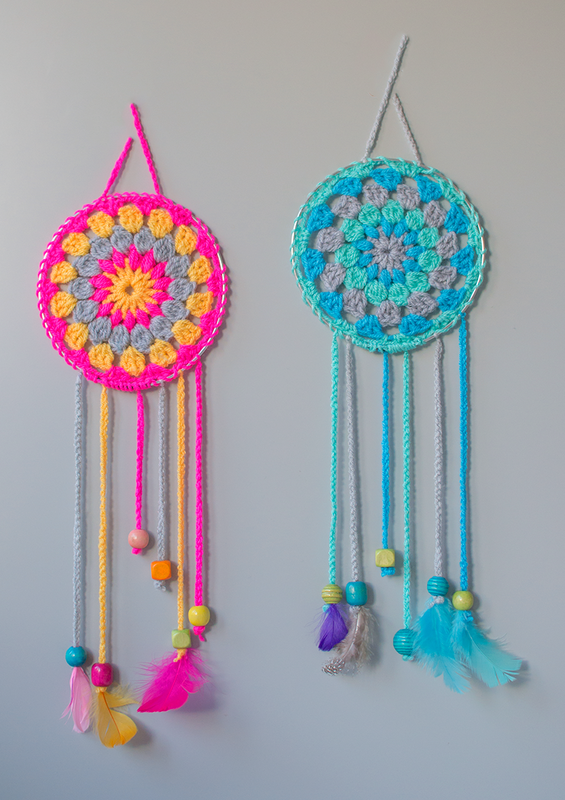 I’m really pleased with how they turned out and the dream catchers are now hanging next to Cherry and Tiger’s bed ready to catch their bad dreams. How to crochet worry dolls. How to make a crochet chevron bag. How to make crocheted Minion glasses. How to make crocheted headbands using tulip stitch. If you love crochet too then do come and follow my Pinterest board, it’s where I share all the things I hope to make at some point.